Originally a medieval fishing port, historic Kinsale in County Cork, Ireland is one of the most picturesque, popular and historic towns on the south west coast of Ireland. It has been hailed as the Gourmet Capital of Ireland, with no shortage of pubs, cafes, and restaurants to suit every taste and budget. Kinsale is still a fishing village. Located some 25 km (18 m) south of Cork City on the coast near the Old Head of Kinsale, it sits at the mouth of the River Bandon and has a population of more than 2000, which increases substantially during the summer months with tourism and boating at their peaks. 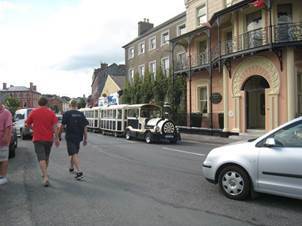 Kinsale is a popular holiday resort for Irish and foreign tourists. The April 2006 census recorded that British nationals made up 9% of the town's population. The anchorage is quite protected, except from the tax collector. Harbour dues are payable on all vessels entering Kinsale Harbour. Harbour fees when we were there were €6.50 per day regardless of whether you were at anchor or in a slip at one of the marinas. There are a limited number of visitors swing moorings available. 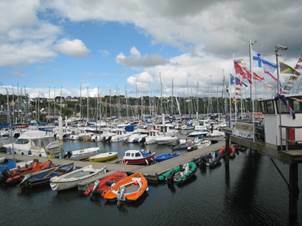 As a pleasure port, Kinsale boasts three full service marinas and is also home to a thriving fishing fleet. 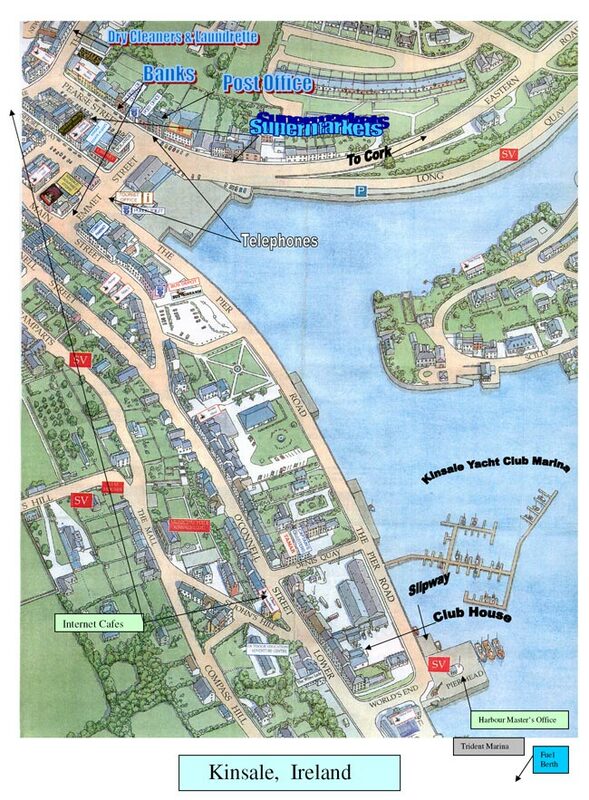 The Kinsale Yacht Club Marina http://www.kyc.ie/ is the best location in town, but the amenities were not top notch. The docks are fine with water and electricity but the prices are out of line. 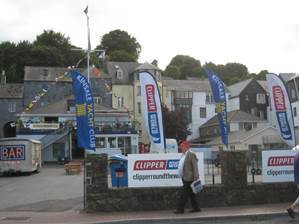 It cost us €49 per day for the slip plus the €6.50 per day for harbour fees. Our total for 3 days was a whopping €160, more than any other marina in the past year of cruising all over the Atlantic and Caribbean. But there’s more. The clubhouse itself has a nice restaurant and bar that serves light fare on race days. It also has wifi. The marina itself is accessed through a single gate which is locked. 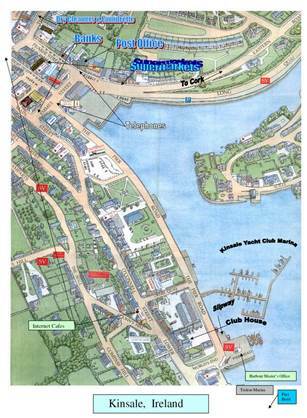 The key code for the gate and wifi are available at the marina check in at the clubhouse. Fuel is available at the Castlepark Marina across the river from KYC. 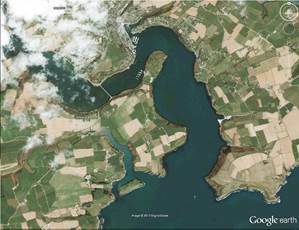 Kinsale was the site of a battle in 1601 that was a turning point in Irish history. English forces defeated an Irish/Spanish force, led by the princes Hugh Roe O'Donnell and Hugh O'Neill. Forced into exile in January 1602 by the victorious English government of Ireland under the leadership of the Lord Mountjoy, a number of the native Irish aristocrats, including the Earls of Tyrone and Tir Conaill, abandoned their lands and fled to mainland Europe in what became known as the Flight of the Earls. 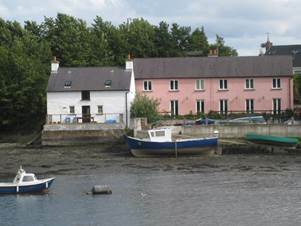 For over 300 years, Kinsale remained a garrison town and port of consequence. Kinsale has two major forts. James's Fort is located on the Castlepark peninsula. Before James fort was constructed, an earlier medieval fortification existed on the site named Castle Ny-Parke. Construction of James Fort, which is named after James I of England and VI of Scotland, started in 1602 immediately after the Siege of Kinsale. The new fort was completed in 1607. Charles Fort, dating from 1677, is an imposing star fort located at Summer Cove directly across from James’s Fort. 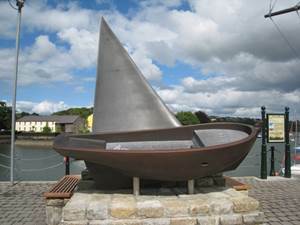 It was built to guard the entrance to Kinsale harbour and specifically to protect the harbour from use by the French and Spanish in the event of a landing in Ireland. An underwater chain would be strung between the two forts across the harbour mouth during times of war to scuttle enemy ships by ripping the bottom out of incoming vessels. In 1690, James II, landed in Kinsale in an attempt to regain his throne, but withdrew to France following his defeat at the Battle of the Boyne. He was the last Roman Catholic monarch to reign over the Kingdoms of England, Scotland, and Ireland. Both forts were occupied by Jacobite forces in 1690 during the Williamite War in Ireland. When the RMS Lusitania was sunk by a German U-boat on 7 May 1915 off the Old Head of Kinsale, some of the bodies and survivors were brought to Kinsale and a subsequent inquest was held in the town's courthouse. A verdict of murder against the Kaiser and the German forces was a major factor in bringing the US into WW I. A statue in the harbour commemorates the effort. 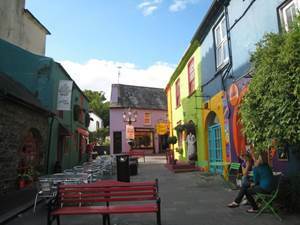 Kinsale is a delightful town and it is a pleasure to roam its ancient streets. It is compact with a quaint air of antiquity in the narrow streets. It is possible to walk the entire central village in 20 minutes. The walk along the harbour is particularly pleasant and a favourite of tourists. The town also has several art galleries and many shops and a very good book store. 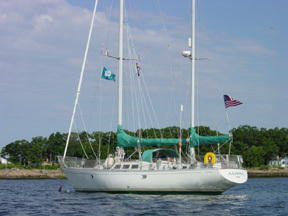 Leisure activities include sailing, sea angling, and golf. Whale watching tours leave from the harbour. Ghost walking tours prowl the streets every evening. 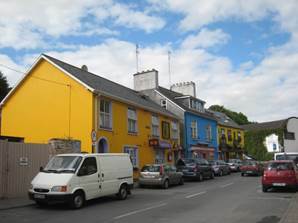 Kinsale is designated a Heritage Town. Prominent buildings in the town include the 800-year old Norman St. Multose's Church (Church of Ireland), St. John the Baptist (Catholic), the Market House and the so-called French Prison (or Desmond Castle, now a wine museum). The town has had a number of famous residents, Alexander Selkirk (the real Robinson Crusoe), Patrick Cotter O'Brien (The Irish Giant), writers Lennox Robinson and Robert Gibbings, Arctic explorers Mortimer and Timothy McCarthy who sailed with Scott and Shackleton, and politicians Tom Johnson, first leader of the Irish Labour Party, and Tommy Mullins, founder of Fianna Fail. Like many towns in Ireland, Kinsale has a rich brewing tradition. Kinsale's dates back to the seventeenth century, when European explorers headed to the New World would stop in for a pint at what used to be Lander's Malt House. Legendary sailors and privateers including Sir Walter Raleigh passed through its quarters. The Kinsale Brewery Company acquired the space in 1997, and in 2001 Kinsale Brewery opened. 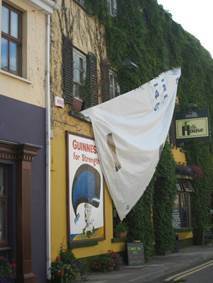 There is some indication that the Kinsale Brewery is closed now but we have not been able to confirm that information. For 101 suggestions of things to do, view this handy brochure. The town is known for its restaurants, and holds an annual "Gourmet Festival". 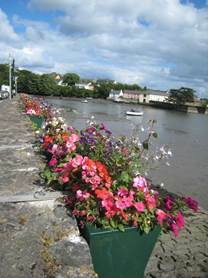 Chef Keith Floyd was previously a resident of Kinsale. There are too many restaurants in town to cover all of them. So we’ll just mention the ones we experienced first-hand. Fishy Fishy is perhaps the best known restaurant in town and one of the best seafood restaurants in Ireland, but definitely pricey. Scoring a reservation mid-summer can be difficult. The food is exceptional, but we found the service somewhat elitist and brusque. Their retail outlet (see Services) is another story and well worth the trip. The pub food and atmosphere is delightful at Jim Edwards at Market Quay. Seafood is their specialty. The meals we had at the Kinsale Yacht Club were very pleasant and reasonably priced. 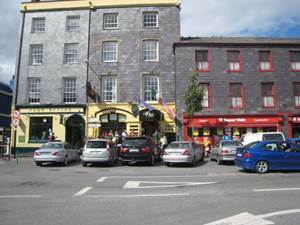 As we said, there is no shortage of restaurants in Kinsale. 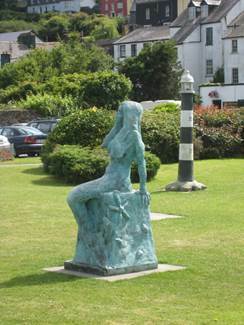 There are 49 listed in Kinsale on Trip Advisor. Despite yachting being such a predominant activity, there are actually few services available for visiting yachtsmen. There are no chandleries, the closest being in Cork. There are no hardware stores that we found. We arrived after a transatlantic crossing with two dinghy engines that wouldn’t start. It took several days to find a dinghy mechanic only to learn that he had gone off to a wedding and no one knew when he would return. We ended up servicing our own engines, and that turned out to be a very useful skill. We did not find any sailmakers either. There are two supermarkets and a produce shop. There’s a SuperValu on Long Quay and Smith’s Supervalu on Pearse Street which has a respectable off license. There is a great bakery just down the street from Fishy Fishy. Best of all Fishy Fishy has a retail outlet across from the Church of Ireland. They serve lunch as a scaled down version of the main restaurant’s dinner menu. They also have fresh fish as well as their private label wines and food products for sale. That was a great find. Highly recommended. There are several internet cafés and the KYC clubhouse also has wifi. There is a dry cleaner and launderette in town called Goods Dry Cleaning on Market Street (right from Pearce Street). They are not inexpensive. We understand that the renovations planned by KYC include addition of laundry facilities.